Stay Cool with Water Tag! This is a wonderful way to spend a hot summer day! 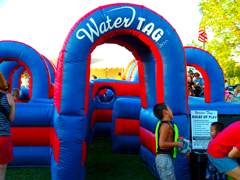 Our inflatable water park and tag is 25-square-feet of walls, mazes, and hiding spots! Run like crazy, hide and wait to ambush, or go diehard! What will be your battle plan?! We provide the water guns and ultra convenient refill station! Let the games begin!